This entry was posted in Uncategorized and tagged Ageing, good therapy, Life Lessons, Thought. Bookmark the permalink. Sometimes you don’t even realize you’re dragging it along until suddenly an event cuts it loose…The relief makes you understand it was there! Good advice. Am trying to do that during this year. Less is more. Reminds me of the adage, “carrying a grudge is letting someone live in your head, rent free! Oh I love that Al! Thanks for sharing. Wise words Lynn. Letting go can be so hard though, but definitely improves one’s state of mind. You are so right Jude! So vey true Louise. We are all guilty of accumulation although I think there are many people who have experienced life altering situations, preventing them from moving forward. 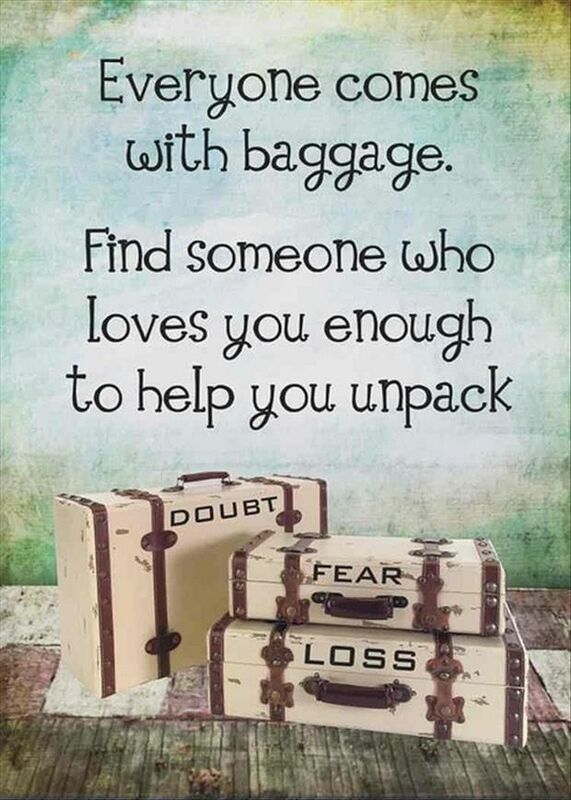 The ability to unpack or let go of some of this baggage seems key to me in allowing us to live our best life. Am I to guess that you are in the process of some emotional spring cleaning? Hahaha! I am picturing you wandering around the house belting out this tune! Whatever the reason for the nudge, it is always a good message. Bearing a grudge never helped anyone, Lynn. 🙂 I can’t imagine that you do. I tried to give that up a long time ago Jo. Too much negative energy that could be used elsewhere! An excellent post! We do all need to let go of all that stuff that we’ve been carrying around forever: the grudges, the guilt, the “would’ve, should’ve, could’ves!” Thanks for the reminder to do a little spring cleaning in our psyches now and then. We are all so much lighter if we let all that stuff go. That emotional baggage can be heavy! Thanks for the reminder, Lynn. It sure can be Laurie. It surprises me sometimes how much people hold on to, taking up so much space in their life. Thanks for visiting! Great Message Lynn. I prefer to have my suitcases filled with Friends and Family, Good Times and Adventures! You are definitely in all of them! I am pretty sure your suitcases are overflowing with friends & family, given the beautiful person you are. I am so grateful to be included in your bags! Love your words, Lynn. I can’t help but think they are inspired by your recent post regarding sudden loss and how fragile life really is. George, what is interesting is that this post has been sitting in my draft for a few years waiting to be re-tweeked & published. Perhaps this was timely from the standpoint that the fragility of life is in the forefront of my mind these days, thus re-enforcing there are few things worth wasting negative energy on & how important it is to purge our bags of all things that in the end, truly don’t matter. Thank you for your ever insightful comments George! They truly are appreciated. Lynn I carried a lot of baggage for many decades. About 15 years ago I did a lot of work to personally free myself. Amazing how much happier and peaceful one can be when such a lifelong load is let go of. You really said it well here in this post. How much do we pile on ourselves that don’t need in our journey? Thanks for a great reminder. Drop the garbage, I say! James, thank you for your eloquent words that only add to this piece. So much wisdom in your comment. Thank you! It’s a difficult task to rid yourself of baggage but it is necessary to ever really be happy again. We are dealing right now with a family member who can not let go of old hurts and just broke her engagement. He was going to come visit on the 5th and we were to meet him for the first time but that has now been cancelled. Oh Emilio, I am sorry to hear of your family member who cannot let go of old hurts. I hope that she finds peace somehow in healing the past so that she can move forward with her life. That’s all we hope for, too! Thanks. Exactly! I once read something to the effect of, you can’t control what happens to you, but you can control how you react. Sometimes hurt/disappointment/frustration needs to run its course because suppressing it does you no good either, but once it has done that, let it go! Very good advice Claire. We have the power to chose how we react & how we deal with things moving forward in life. Thank you so much for visiting & contributing to this piece! That’s sometimes easier said than done. The process of letting go can take a while. That said, the only way to start is by making a conscious decision to stop thinking about it. I like to travel light! I totally agree Susie. There are certain kinds of baggage that are much more challenging to unpack. This is particularly important as we get older. When younger, baggage may not feel that heavy because of two things: we have not lived long enough AND we feel energetic, like we can carry any weight we want. I love your posts. I am nominating you for the Sunshine Blogger’s Award. Thank you so much for the compliment, I am so glad you enjoy my writing. I made the decision to leave my blog an award free zone in early days of writing but I am truly honoured for the nomination . Hope you can visit again soon!